Grandpa says circles are all around us. We just have to look for them. 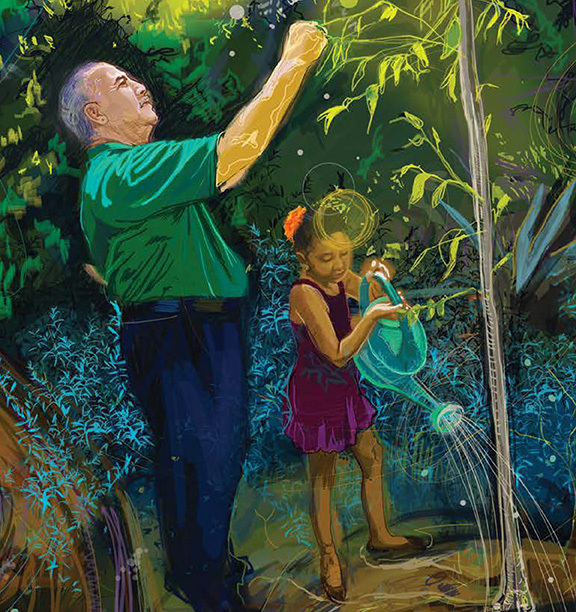 In this warm, gentle story that celebrates family, culture, community and the connectedness of all things, a young girl and her grandfather work side by side in their vegetable garden, hang out in their backyard, walk around their neighborhood—and find circles to see and contemplate. A rainbow, whose other half is down below the earth, “where water and light feed new life.” And stems, leaves, and seeds—veggie leftovers—“to bury back in the ground.” And round body parts, such as bellies and eyes, to laugh about. And bicycle wheels, and the sun and the moon, and gentle lessons about the cycles of birth and death. I was given a class assignment to draw a timeline of my life. Birth was the beginning. First steps and first fallen tooth were milestones. I wondered aloud how my timeline would continue, and more importantly, how it would end. My father shook his head when he heard me. “People will tell you it’s a line, but we believe it’s a circle,” he said, gathering two imaginary points of a timeline and joining them midair to form a circle. While “timelines” are typical first-grade assignments, they undermine Indigenous knowledges and nonlinear ways of visualizing time. 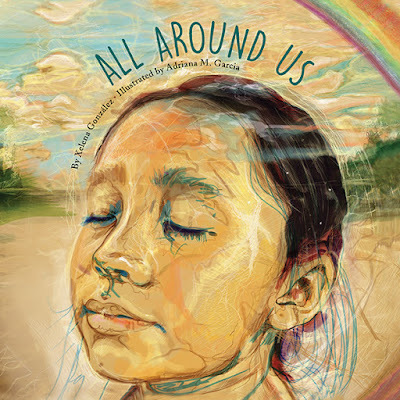 All Around Us should have begun here, with an example of what Indian kids—such as the young Xelena—often encounter in school, and with the kind of loving affirmations that Indigenous family members—such as her grandfather—often give to their kids. Since all of her art depicts the outside, Garcia used a rich, textured earthy palette of mostly greens and browns, with brightly colored vegetables and some pinks and yellows as accents. She told me that she began this project with photos, which she digitized and collaged and used as a guide, and then added the background details. But rather than creating a photorealistic piece, her “imagination took over” as she redrew the images with digital paint, inserting mostly circular lines that both complement and transcend the story. I’m especially impressed by the differing skin tones between Grandpa and granddaughter, something that few picture-book illustrators get right. And, in many of the illustrations, lines almost blur as the two literally blend in with their environments. Where they’re digging in the garden, for instance, they appear to be dark brown on one spread and green on another; and where they’re sitting in sunlight, smiling at each other, they are yellow. While González makes clear in her author’s note that it’s not her own family practice to bury their relatives’ ashes in this way, educators may want to use this passage in a class discussion—at another time, so as not to interrupt the story—of different practices associated with death and dying. Finally, we walk to the front yard to water our smallest tree. Grandpa planted it for me on the day I was born, and everything that fed me while I grew in my mother’s belly is buried at the roots. I love bringing water to the apple tree that is already taller than I am. Here, young children who are literal thinkers might imagine their mothers’ bellies as filled with cereal and bananas to feed them as they grew inside; so there’s an opportunity to introduce the terms, “placenta” and “umbilical cord,” which are often buried at the roots of newly planted trees to connect newborns to the land. All Around Us is a quiet, beautiful story, and is highly recommended.